William Trevor Gwyn was a banker and broker who lived at 786 Gilford Street in 1916. William Trevor Gwyn (sometimes called “Trevor”) was born in Dundas, Ontario, on January 14, 1880. His father was Herbert Charles Gwyn (1846-1926), who was a lawyer and soldier. William’s mother was Charlotte Elizabeth Osler (1847-1925). 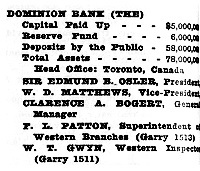 In 1896, William began to work for the Dominion Bank in Oshawa, Ontario. He was later with the bank in Guelph, Belleville and Toronto, and Winnipeg. On May 31, 1906, in Toronto, he married Emily Harriett Spragge. She was born on November 28, 1880, in Toronto. Her father was Edward William Spragge (1843-1920), who was a physician. Her mother was Harriet Elizabeth Morris (1844-1924). For a time William was the assistant manager of the Dominion Bank in Montreal. In 1913, he was in Winnipeg, working as the western inspector for the bank. Henderson’s Winnipeg Directory, 1913, page 922; http://peel.library.ualberta.ca/bibliography/921.3.14/830.html. In 1913, he was living at 397 River Avenue in Winnipeg. About 1915, he became the acting manager of the Vancouver branch of the bank. He lived at the following addresses in Vancouver. In 1917 and 1918, he was the manager of the Vancouver branch of the bank. He later lived in Winnipeg, where he was with the investment firm of Osler, Hammond and Nanton. 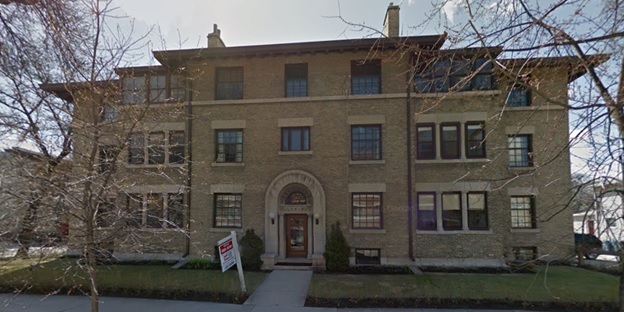 Wardlaw Apartments, 544 Wardlaw Avenue, Winnipeg, Manitoba; Google Streets, searched February 2, 2016; image dated May 2014. In 1931, he became a director of the Monarch Life Assurance Company. In 1932, he retired from Osler, Hammond and Nanton. In the early and mid-1940s, he was still acting as a financial agent. He was living at 1B in the Tudor Wellington Apartments, 264 Wellington Crescent. Wellington Apartments, 264 Wellington Crescent, Winnipeg, Manitoba; Google Streets, searched February 2, 2016; image dated April 2014. He died between 1946 and 1968. Emily died in Winnipeg on December 19, 1968. William and Emily had the following children. Charles Featherstone Gwyn was born on November 29, 1909. On May 15, 1937, in Winnipeg, Manitoba, he married Marion Benson McEachern. In 1939 he was a yardmaster for the Canadian Pacific Railway in Winnipeg. Elizabeth Emily Gwyn was born on November 29, 1909. On March 16, 1940, in Toronto, she married James Arthur Harshaw. He was born on January 31, 1903, in Napanee, Ontario. He was the son of Archibald Thomas Harshaw of Napanee. After the marriage, Elizabeth and James lived at 112 Hudson Drive, Moore Park in Toronto. James worked for the Dominion Bank in Ontario, Calgary, Alberta, and Winnipeg, Manitoba. James died on January 30, 1987. Elizabeth died on January 2, 1992. James and Elizabeth had a son named William A. (“Bill”) Henshaw. William Trevor Gwyn was born in Winnipeg, Manitoba, on May 6, 1914. He died in Winnipeg on February 13, 1922. He was buried in Saint John’s Anglican Cathedral Cemetery in Winnipeg. John Webster Grant, “Osler, Featherstone Lake,” in Dictionary of Canadian Biography, vol. 12, University of Toronto/Université Laval, 2003–, accessed February 3, 2016, http://www.biographi.ca/en/bio/osler_featherstone_lake_12E.html. “England Births and Christenings, 1538-1975,” database, FamilySearch (https://familysearch.org/ark:/61903/1:1:N5DV-Q2Z : accessed 3 February 2016), Featherstone Lake Osler, 30 Jul 1832; citing , reference ; FHL microfilm 916,970. “England, Cornwall and Devon Parish Registers, 1538-2010,” database with images, FamilySearch (https://familysearch.org/ark:/61903/1:1:QJH1-9PCQ : accessed 3 February 2016), Featherstone Lake Osler, 30 Jul 1832; citing Christening, Falmouth, Cornwall, England, Cornwall Records Office, Truro. “England Marriages, 1538–1973 ,” database, FamilySearch (https://familysearch.org/ark:/61903/1:1:NVRP-39Q : accessed 3 February 2016), Featherstone Lake Osler and Ellen Free Pickton, 06 Feb 1837; citing Budock,Cornwall,England, reference ; FHL microfilm 226,137, 246,834. “Find A Grave Index,” database, FamilySearch (https://familysearch.org/ark:/61903/1:1:QV2Y-R949 : accessed 3 February 2016), Featherstone Lake Osler, 1895; Burial, Toronto, Toronto Municipality, Ontario, Canada, Saint James Cemetery; citing record ID 86838145, Find a Grave, http://www.findagrave.com/cgi-bin/fg.cgi?page=gr&GRid=86838145. “Find A Grave Index,” database, FamilySearch (https://familysearch.org/ark:/61903/1:1:QV2Y-R94M : accessed 3 February 2016), Ellen Free Osler, 1907; Burial, Toronto, Toronto Municipality, Ontario, Canada, Saint James Cemetery; citing record ID 86838183, Find a Grave, http://www.findagrave.com/cgi-bin/fg.cgi?page=gr&GRid=86838183. Herbert Charles Gwynn, lawyer, Canadian Men and Women of the Time, Second Edition, Henry James Morgan, editor; Toronto, William Briggs, 1912, page 484; https://archive.org/stream/canadianmenwomen00morguoft#page/484/mode/1up. “Ontario Marriages, 1869-1927,” database with images, FamilySearch (https://familysearch.org/ark:/61903/1:1:FMFY-X29 : accessed 3 February 2016), Herbert Charles Gwyn and Charlotte Elizabeth Osler, 03 Jul 1872; citing registration , Dundas, Wentworth, Ontario, Canada, Archives of Ontario, Toronto; FHL microfilm 1,862,698. “Ontario Deaths, 1869-1937 and Overseas Deaths, 1939-1947,” database with images, FamilySearch (https://familysearch.org/ark:/61903/1:1:JK7B-Y44 : accessed 3 February 2016), Herbert Charles Gwyn, 08 Jan 1926; citing Wellington, Ontario, 036446, Archives of Ontario, Toronto; FHL microfilm 2,079,859. “Find A Grave Index,” database, FamilySearch (https://familysearch.org/ark:/61903/1:1:QV2Y-57Y4 : accessed 3 February 2016), Herbert Charles Gwyn, 1926; Burial, Dundas, Hamilton Municipality, Ontario, Canada, Grove Cemetery; citing record ID 86887547, Find a Grave, http://www.findagrave.com/cgi-bin/fg.cgi?page=gr&GRid=86887547. “Ontario Deaths, 1869-1937 and Overseas Deaths, 1939-1947,” database with images, FamilySearch (https://familysearch.org/ark:/61903/1:1:JFRP-J3V : accessed 3 February 2016), Charlotte Elizabeth Gwyn, 26 Jan 1925; citing Wentworth, Ontario, Item 3, 34945, Archives of Ontario, Toronto; FHL microfilm 2,057,337. “Find A Grave Index,” database, FamilySearch (https://familysearch.org/ark:/61903/1:1:QV2Y-57YW : accessed 3 February 2016), Charlotte Elizabeth Gwyn, 1925; Burial, Dundas, Hamilton Municipality, Ontario, Canada, Grove Cemetery; citing record ID 86887497, Find a Grave, http://www.findagrave.com/cgi-bin/fg.cgi?page=gr&GRid=86887497. “Ontario Births, 1869-1911,” database with images, FamilySearch (https://familysearch.org/ark:/61903/1:1:FMCJ-J9G : accessed 3 February 2016), William Trevor Gwyn, 14 Jan 1880; citing Birth, Dundas, Wentworth, Ontario, Canada, citing Archives of Ontario, Toronto; FHL microfilm 1,845,401. 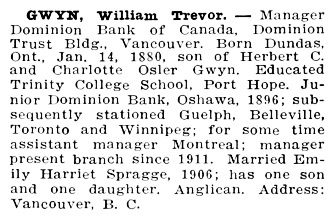 “Canada Births and Baptisms, 1661-1959,” database, FamilySearch (https://familysearch.org/ark:/61903/1:1:F25C-C31 : accessed 3 February 2016), William Trevor Gwyn, 14 Jan 1880; citing Dundas, Wentworth, Ontario, 14 Jan 1880, reference cn 38608; FHL microfilm 1,845,401. “Canada Census, 1901,” database, FamilySearch (https://familysearch.org/ark:/61903/1:1:KHGV-NMK : accessed 3 February 2016), William Gwynn in household of Charles Wilson, B, Toronto (west/ouest) (city/cité), Ontario, Canada; citing p. 22, Library and Archives of Canada, Ottawa; http://automatedgenealogy.com/census/View.jsp?id=109661&highlight=8&desc=1901+Census+of+Canada+page+containing+William+T+Gwyn. “Ontario Marriages, 1869-1927,” database with images, FamilySearch (https://familysearch.org/ark:/61903/1:1:KZ17-KQP : accessed 3 February 2016), William Trevor Gwyn and Emily Harriett Spragge, 31 May 1906; citing registration , Toronto, York, Ontario, Canada, Archives of Ontario, Toronto; FHL microfilm 1,871,549. W. T. Gwyn, 397 River Avenue, Winnipeg, Manitoba, Henderson’s Winnipeg Directory, 1913, page 609; http://peel.library.ualberta.ca/bibliography/921.3.14/517.html]. 1921 Canada Census, William Trevor Gwynn [sic], Reference Number: RG 31; Folder Number: 31; Census Place: Winnipeg (City), Winnipeg South, Manitoba; Page Number: 29; Ancestry.com. 1921 Census of Canada [database on-line]. Provo, UT, USA: Ancestry.com Operations Inc, 2013. 264 Wellington Crescent, Winnipeg, Manitoba; City of Winnipeg; http://www.winnipeg.ca/ppd/historic/pdf-Commemorative/Wellington264-overview.pdf. “Canada Census, 1881,” database, FamilySearch (https://familysearch.org/ark:/61903/1:1:MVFQ-SF6 : accessed 3 February 2016), Edward Spragge, St-Andrew Ward, Toronto (City), Ontario, Canada; citing p. 132; Library and Archives Canada film number C-13247, Library and Archives Canada, Ottawa, Ontario; FHL microfilm 1,375,883. “Canada Census, 1891,” database, FamilySearch (https://familysearch.org/ark:/61903/1:1:MWGX-QGG : accessed 3 February 2016), E W Sprague, St Patricks Ward, Toronto City, Ontario, Canada; Public Archives, Ottawa, Ontario; Library and Archives Canada film number 30953_148173. “Canada Census, 1901,” database, FamilySearch (https://familysearch.org/ark:/61903/1:1:KHGV-Q5D : accessed 3 February 2016), E. W. Spragge, B, Toronto (west/ouest) (city/cité), Ontario, Canada; citing p. 13, Library and Archives of Canada, Ottawa. “Ontario Deaths, 1869-1937 and Overseas Deaths, 1939-1947,” database with images, FamilySearch (https://familysearch.org/ark:/61903/1:1:J65C-JYP : accessed 3 February 2016), Harriett Elizabeth Spragge, 02 Jul 1924; citing Toronto, York Co., Ontario, p 48 cn 4486, Archives of Ontario, Toronto; FHL microfilm 2,022,135. “Ontario Births and Baptisms, 1779-1899,” database, FamilySearch (https://familysearch.org/ark:/61903/1:1:XLTN-KL6 : accessed 3 February 2016), Emily Harriett Spragge, 28 Nov 1880; citing Toronto, York, Ontario; FHL microfilm 1,845,402. “Canada Births and Baptisms, 1661-1959,” database, FamilySearch (https://familysearch.org/ark:/61903/1:1:F227-2DQ : accessed 3 February 2016), Emily Harriett Spragge, 28 Nov 1880; citing Toronto, York, Ontario, 28 Nov 1880, reference cn 41667; FHL microfilm 1,845,402. “Ontario Births, 1869-1911,” database with images, FamilySearch (https://familysearch.org/ark:/61903/1:1:FMCK-G96 : accessed 3 February 2016), Emily Harriett Spragge, 28 Nov 1880; citing Birth, Toronto, York, Ontario, Canada, citing Archives of Ontario, Toronto; FHL microfilm 1,845,402. “Canada Census, 1881,” database, FamilySearch (https://familysearch.org/ark:/61903/1:1:MVFQ-SFN : accessed 3 February 2016), Emily Spragge in household of Edward Spragge, St-Andrew Ward, Toronto (City), Ontario, Canada; citing p. 132; Library and Archives Canada film number C-13247, Library and Archives Canada, Ottawa, Ontario; FHL microfilm 1,375,883. “Canada Census, 1891,” database, FamilySearch (https://familysearch.org/ark:/61903/1:1:MWGX-QGR : accessed 3 February 2016), Emily Sprague, St Patricks Ward, Toronto City, Ontario, Canada; Public Archives, Ottawa, Ontario; Library and Archives Canada film number 30953_148173. “Canada Census, 1901,” database, FamilySearch (https://familysearch.org/ark:/61903/1:1:KHGV-Q5F : accessed 3 February 2016), Emily H Spragge in household of E. W. Spragge, B, Toronto (west/ouest) (city/cité), Ontario, Canada; citing p. 13, Library and Archives of Canada, Ottawa. “Recensement du Canada de 1911,” database, FamilySearch (https://familysearch.org/ark:/61903/1:1:276T-FS6 : accessed 3 February 2016), Emily H Gwyn in entry for Edward W Spragge, 1911; citing Census, Toronto Centre Sub-Districts 18-62, Ontario, Canada, Library and Archives of Canada, Ottawa, Ontario; FHL microfilm 2,418,525; http://automatedgenealogy.com/census11/View.jsp?id=52210&highlight=16&desc=1911+Census+of+Canada+page+containing+Emily+H+Gwyn%28%3F%29. “Find A Grave Index,” database, FamilySearch (https://familysearch.org/ark:/61903/1:1:QVG5-1F3S : accessed 3 February 2016), Emily H Gwyn, ; Burial, Winnipeg, Greater Winnipeg, Manitoba, Canada, Saint Johns Anglican Cathedral Cemetery; citing record ID 134436597, Find a Grave, http://www.findagrave.com/cgi-bin/fg.cgi?page=gr&GRid=134436597. “Godfrey Edward Spragge, 78, lumber trader and former Canadian football star, died Sunday in Wellesley Hospital. For many years he was associated with the Victoria Harbor Lumber Co., and was a director of the Crown Life Insurance Co. of Toronto. Born in Toronto, he was educated at Trinity College School, Port Hope, and was a top footballer and oarsman. He played for the Argonauts and wa a past president of the Toronto Golf Club. “Pink Is Decorative Note at Gwyn-McEachern Bridal in Augustine,” Winnipeg Tribune, May 15, 1937, page 15. Henderson’s Brandon Manitoba Directory, 1939, page 137; http://peel.library.ualberta.ca/bibliography/3176.34/137.html: Gwyn C F ydmaster CPR h 304 11th St.
Archibald Thomas Harshaw, of Napanee, http://www.lennoxandaddingtonhistoricalsociety.ca/harshaw.html [probably the grandfather of James Arthur Harshaw]. “Elizabeth Emily Gwyn Weds James Arthur Harshaw,” Winnipeg Tribune, March 16, 1940, page 11. “Find A Grave Index,” database, FamilySearch (https://familysearch.org/ark:/61903/1:1:QVG5-1F37 : accessed 3 February 2016), William Trevor Gwyn, ; Burial, Winnipeg, Greater Winnipeg, Manitoba, Canada, Saint Johns Anglican Cathedral Cemetery; citing record ID 134436596, Find a Grave, http://www.findagrave.com/cgi-bin/fg.cgi?page=gr&GRid=134436596.